My fall entertaining marathon started last weekend with my son’s 5th birthday party. My home was filled with family and good friends, and we all shared some laughs and some good food. 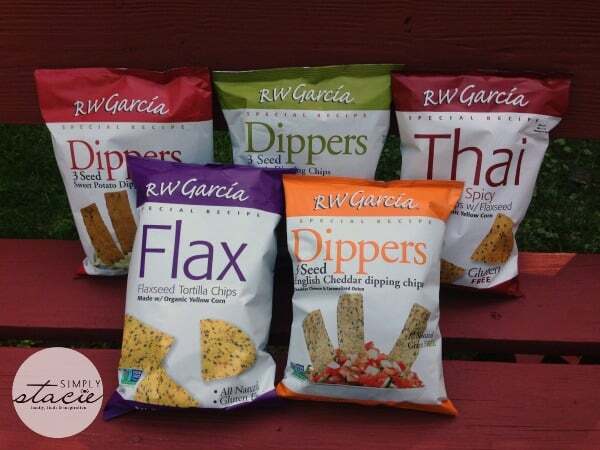 I always like to put out snacks for the kids and adults to share, and this year I was lucky enough to receive five bags of yummy healthy snacks from RW Garcia in time for the party. The Cheddar and Carmelized Dipping Chips didn’t make it to the party – they were gone before the party even started! These chips have a fantastic texture and taste and the cheddar and onion flavors are a perfect mix. My husband and I enjoyed these straight out of the bag. I decided to wait until the party day to open the other bags so that my family and friends had a good chance of tasting the chips too! The Sweet Potato Chips were a big hit all around. Adults and kids alike had their hand in that bowl. The Flaxseed Tortilla Chips have a great crunch and were perfect with some salsa. All of the chips were great and the proof is in the empty chip bowls! I love that these chips are not only great tasting, but they are a great healthy choice for parties, lunch boxes, or any time we’re in a chip mood. 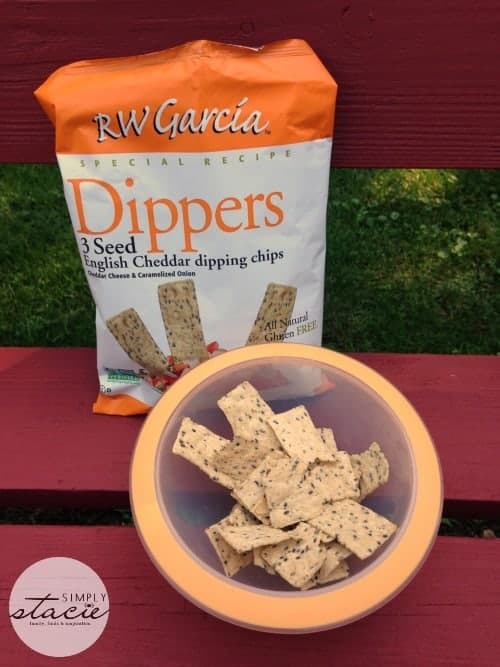 The RW Garcia story started out 30 years ago when RW and Margaret Garcia set out to create an irresistible tortilla chip that not only tasted great, but was healthy too. They started out selling their chips out of the family van. Today RW Garcia products are available throughout North America, Europe, Asia and Australia. They use only the highest quality, all natural ingredients and all their products are verified non-GMO, certified gluten free and contain no additives or preservatives. They have truly created a snack that you can feel good about eating and sharing with your family and friends. You can find their snacks at a store near you using their online store locator, or you can order them online from sites like Amazon. To learn more about the products RW Garcia has to offer, visit their website. You can also find them on Facebook and Twitter. I haven’t seen these in any store yet but they look delicious.Nice and crunchy. These look and sound delicious, I hadn’t heard of these before. I haven’t seen these in stores yet but I have been reading some good reviews about them online. Looking forward to trying them at some point. I like the idea of the dippers. We enjoy have different salsas and dips for snacks or to take to work parties. This would add a nice flavor twist to the normal plain chips. Plus you have me intrigued about the cheddar and onion ones. These chips sound amazing! I love that they’re natural and non-GMO! They aren’t available in my town, unfortunately, but they’re available in the city where some of my family lives, about an hour from me, and actually really close to where my Mom lives, so next time I go to visit her, I’ll be making a “chip stop”! We have a lot of football-watching parties, and I am always on the lookout for new things to serve.